Chalkboard paint is everywhere these days. Here are a few ways you can use this fun product to repurpose items in your home and get more organized in the process. 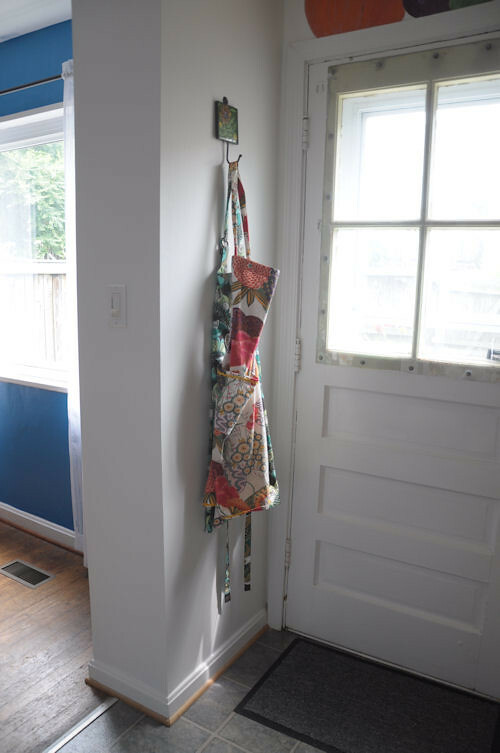 This corner of my itty bitty kitchen seemed like wasted space (I rarely use the aprons). I wanted a place to write the weekly menu, keep an ongoing shopping list, and store coupons. 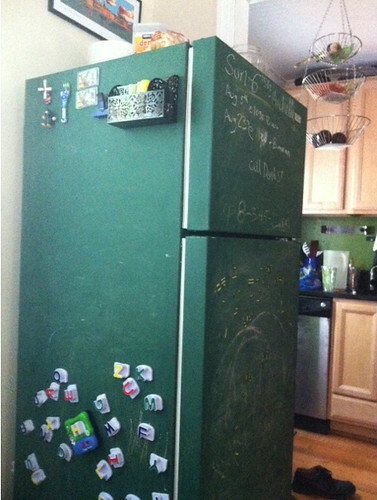 The refrigerator is covered with kid magnets, drawings, school memos, etc. — coupons were going unused and shopping lists were left ignored amongst the clutter. So I found a new place for the aprons and set out to create a magnetic chalkboard to keep our kitchen a little more organized. Step 1: First I determined the size I wanted — roughly 20″ x 22″ — and marked the space off with painter’s tape. Following the instructions on the can, I painted three coats of magnetic primer on the wall, waiting about 30 minutes between each coat. A word of caution — this stuff smells really bad! Make sure you ventilate the room and turn on a fan. When the primer was dry, I tested it with a magnet and it worked! While it’s a fun product, I don’t think I will be using it again. In addition to the smell, it took three days to fully wash the splatter off my hands. Step 2: I painted the wall with two coats of the chalkboard paint. Step 3: I had an IKEA ledge shelf (RIBBA) lying around the house so I screwed the shelf into the wall under the chalkboard to store chalk, an eraser, and narrow tins from IKEA (TRIPP) for coupons. Now I can stay organized with the dinner menu in plain sight and a shopping list ready to go. What do you do when your kitchen renovation budget doesn’t include a new fridge? Do what our reader Rachel did — paint the fridge with chalkboard paint. Not only does the fridge look great, it also keeps her kids busy while she’s trying to cook. Rachel says she cleaned the fridge, lightly sanded, then applied the chalkboard paint. No other prep was needed. 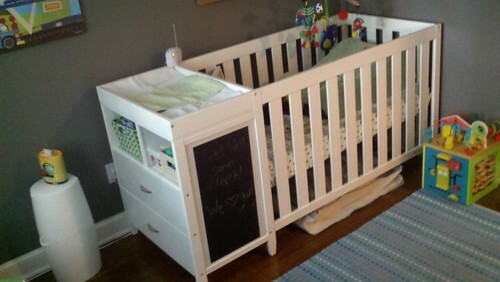 Chalkboard paint comes in a variety of colors, and Rachel picked the green because it reminded her of her childhood. Brilliant! 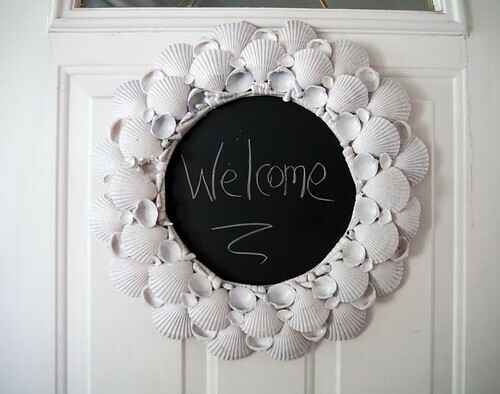 Make your guests feel welcome with a quick and easy sign for your front door. 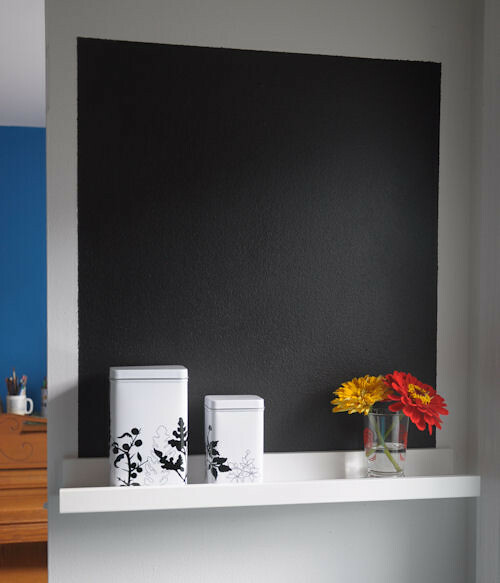 In this example, Sara took a shelled picture frame from a thrift store (which she had already painted white), removed the glass, and painted the back with black chalkboard paint. In just a few minutes, she created a simple but unique accessory to make her home feel more inviting. And if you are looking for the chalkboard look without the mess or if you need something a little less permanent, try chalkboard stickers/decals. They peel right off and locally they can be found at the Crate and Barrel outlet in Old Town Alexandria. Below, Sara applied them to the side of her son’s crib. This once blank spot is now a place for her kids to scribble and have fun. Love love this Katie! I still haven’t figured out where or how to incorporate it in my house, but this is an excellent idea. Keep em coming.